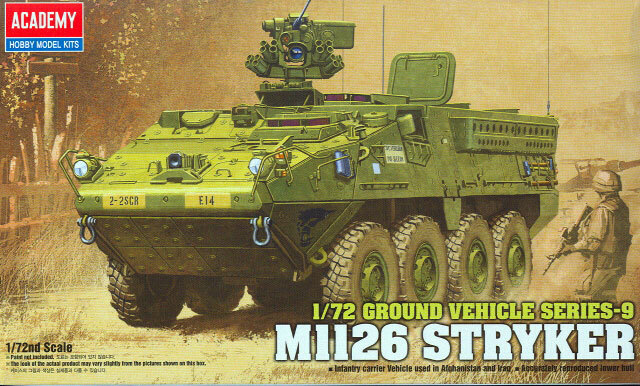 The M1126 Stryker was a long time coming to the US Army as there was a bias against wheeled combat vehicles for many years. While the US Army was one of the original requesters of the Light Armored Vehicle, which was a GMC derivation from the Swiss Mowag Piranha vehicle, they bowed out at the last minute and let the LAV family go to the Marine Corps. Later, when the need for a wheeled armored combat vehicle resurfaced, they did not go with that vehicle family but instead wound up selecting the Piranha III follow-on, which was accepted for service as the Stryker family of wheeled combat vehicles. As most Army personnel know, the name was selected to honor two unrelated soldiers who were awarded the Medal of Honor, not the John Wayne character from “The Sands of Iwo Jima” (who was a Marine sergeant anyway). The Stryker family is still in the process of being fielded, with the 105mm gun armored variant – the Mobile Gun System – being the latest to see action in Iraq. But due to the massive amount of rocket-propelled grenades used by the anti-Coalition forces in Iraq, most of the vehicles there have now been fitted with “slat” armor arrays, also called bar armor, grille armor or “Boom Shields” based on the country making and offering the designs. In action the Stryker has proven fairly combat worthy – casualties have not been high as it does offer good protection, is fast and quiet when approaching fighter strongholds, and due to the advanced electronics systems offers good situational awareness to its crew and dismount team. Academy’s 1/72 scale version is the first one offered in styrene in this scale, and unlike many of their larger scale kits is a really nicely done effort. The model appears to be based on an initial issue version of the vehicle and does not have any of the later improvements or changes such as the wheel rings or the “slat” armor arrays, but what is there is well done and matches up with the photos in the “Wings and Wheels” book very well. The hull top and bottom are “slide molded” and have a tremendous amount of side details in place on them. The suspension parts are very nicely with separate drive shafts, shock and spring units, steering arms, and lower A-frame arms. The tire tread pattern leaves a bit to be desired but is better than some efforts in this scale. From what I gather from the directions a small nub on the inside of the steering wheels has to be removed; the directions are “seen and do” pictographs and not very clear as to what they want. All six crew hatches are separate parts, but there is no interior provided for the model. The winch and fairlead are separate parts but there is no cable or lead provided. The M151 weapons station consists of seven parts and looks close to the one provided in the AFV Club kit albeit much smaller and simpler. One set of markings and finishing instructions is included for E Troop, 2nd Squadron, 2nd Stryker Cavalry Regiment (twenty years ago affectionately called the “Two-Two Zoo”) in Germany. For once these look complete and accurate, so Academy must have done some decent research on this model. Overall this is a very nicely done effort and should be a nice addition to modern US armor collections covering contemporary combat. Thanks to Bob Lewen of MRC for the review sample.